Al though Haroon was a small town but Allah was kind enough to its people and showering his blessings on them in those days. 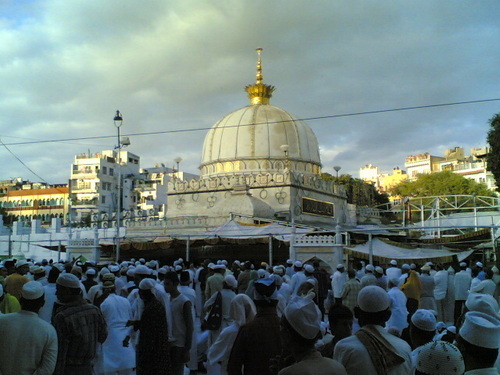 Hazrat KHWAJA SHAIKH USMAN HAROONI (R.A) was there and its presence was filling the town with prosperity and blessing of ALLAH. Hazrat Shaeikh Usman Harooni (R.A) was among Mashaik –E-Kubra and people from far and near were gaining their desires fulfilled from him. I presented myself in an assembly where august personalities were gathered and were sitting with great respect. I sat down with great respect facing Qibla. He then asked me :"Recite Surah Baqar". At the end Hazrat KHWAJA SHAIKH USMAN HAROONI (R.A) put a special Turkish cap, called Kulah-e-chahar- turki on my head and awarded me a Chugha-e-Mubarak (gown) to put on and then asked me to sit and I sat down. Now he instructed me to recite Surah-e-Ikhlas a thousand times. When I finished, he said,"Our Mashaik complete a mushahida of a day and night, so go and complete the mushahida for the same period. In obedience, I spent one day and one night in prayers and worshiping Allah. Next day I presented myself before him. He asked me to sit and I sat down. He said, " Look into the sky ". I did. He then enquired. " As to where do you see ?". Later on, he pointed towards a brick, laying in a corner and asked me to remove it. There were some dinars under it. He instructed me to distribute them among the poors, and that I did . At the end he said :"Be with us for a few days." And it was a pleasure for me to be with him.